I am probably in a sizeable minority of metal fans who have heard of Sabaton, but have not heard their music. My power metal loving friends tell me it is a big omission and I will have to take them at their word. My advantage then in evaluating Civil War is not going to be prejudiced on the fact that a substantial core of Civil War are Sabaton breakaways, so do not expect a comparison to surface in this review. Instead, Gods and Generals managed to significantly quell my allergies to power melodic metal I seem to be having these days, so I was able to enjoy this album for what it is in its own right. Another surprise waiting for me with Civil War was the fact that one of my most favorite Swedish vocalists Nils Patrick Johansson is singing on Gods and Generals and has been with Civil War pretty much since their conception. His characteristic, spectacular, accented with a soft “L”, throaty delivery, going from gruff to high pitch on a moment’s notice, have graced Wuthering Heights, Astral Doors and Richard Andersson’s Space Odyssey and benefits Gods and Generals tremendously. Harp sounds and symphonic dawn of War of the World do not quite foretell what is coming, hearty, not overproduced, not over the top, but mightily engaging heavy metal, with hooks galore and engaging choruses throughout. War of the World and closing title track then make good bookends to a war themed album, and god knows mankind provided no shortage of warfare related topics. 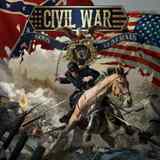 Civil War take advantage then of a plentiful subject matter, recalling episodes from both medieval and recent history. Although I do not possess it, I suspect the booklet to read like a history book with meaningful specific lyrics. Where needed, the band pipes in militaristic marches (Bay of Pigs) or beating tom drums (title track), while never forgetting to deliver a central moment to a song, the monster anthemic chorus (Bay of Pigs), the final triumphant double bass gallop (title track), or a Moscow Nights-like solo (Bay of Pigs). The truth is there are no terrible tracks on Gods and Generals. From steely, fast and energetic USS Monitor, to bagpiped properly referenced The Mad Piper, to straightforward and catchy Braveheart, to touching Viking power ballad Tears from the North, to profound and symphonic Schindler’s Ark, every song on the album hits a spot, and there is never a need to press a skip button. Nils Patrick Johansson takes on many faces, from storyteller (Braveheart) to deep and reflective (Schindler’s Ark) and is often buttressed by a large backing group creating an impression of large live crowd. This bodes well for live performances audience having clear cues as to when to plug in. I mentioned at the beginning that, with age, power metal is less and less my cup of tea, but albums like Gods and Generals make me wish I rethink that position.